A French Navy Torpedo Boat which adhered to General de Gaulle’s Free French Force and was manned by a mixed French & British crew and under the command of the British Navy. 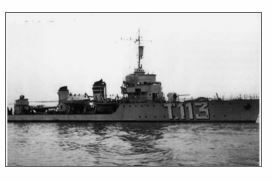 Sank in heavy weather on 14.12.1940 whilst escorting a west bound convoy. There were only three survivors from a complement of 92.